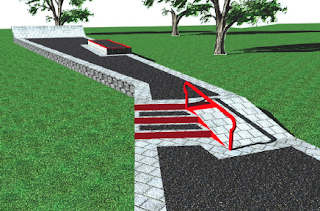 The plot of land isn't being developed solely for a skatepark, riders and skaters need to realize that. A small skatepark is being built as part of a larger public park, but there will be space for passive recreation, a garden, and potentially a small play scape for younger children. There is no possibility of changing the skatepark location because the park is being paid for by the energy company. That plot of land is the only space that they are willing to fund development of. If they don't build a skatepark there, the town won't get one at and all the money will be used to build a public garden on the plot of land. The park cannot be expanded or dug down any due to buried pipes and the bordering apartment complex. Apparently the bowl corner seen in the picture below only has 3' trannys. The park builder is working to get the town to approve them being built up to 4' which would require a little expansion of the deck space. Basically what it comes down to is beggars can't be choosers, at least M-Town will have something. 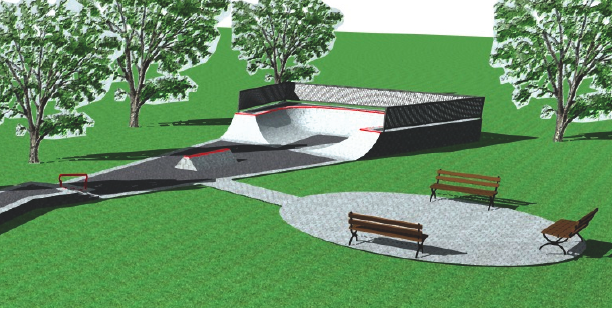 The park is slated to be done by the end of November so some sessioning can take place before the snow comes.